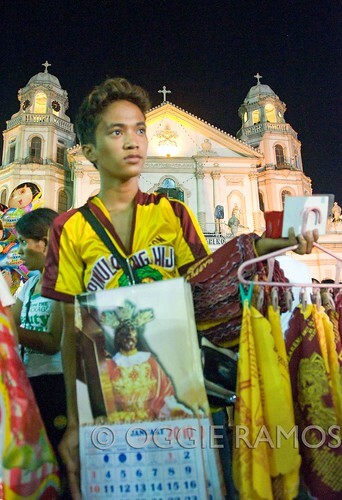 Some people may call it bordering on idolatry, others as blind faith, but I personally see the annual outpouring of sentiments for the Black Nazarene of the Quiapo church as a wholehearted devotion to a favorite patron, which in this case is not really a saint but rather the prostrated Christ bearing the cross. TRIAL BY FIRE. According to the Archdiocese of Manila, the statue has been housed at the Saint John The Baptist Church (now known as the Minor Basilica of the Black Nazarene) in downtown Manila since 1787. A Spanish priest brought the statue to Manila in 1607 aboard a ship. The ship caught fire which left the image burned though intact. The faithful lovingly preserved the blackened statue which has been reported to have made miracles happen to those who touched it. The statue rarely leaves the Basilica save for processions during Good Friday and January 9, its feast day. On its feast day, the statue is paraded on a gilded carriage with ropes pulled by participants, many of whom walk barefoot to signify humility. Others will try to move closer to the statue (a miraculous feat in itself considering the sea of bodies trying to do the same thing) and wipe it with a handkerchief or towel which is reputed to heal and make miracles happen. The statue's following continues to grow with the passing of the years which prompted the parish to change the itinerary as necessary. For this year, the theme is "Tunay na deboto, matuwid at masunuring katiwala ng Poong Hesus Nazareno" (The true devotee -- an honest and obedient trustee of the Lord Jesus, the Nazarene). RAMPANT COMMERCIALISM? OR FAITHFUL DEVOTION? I came to hear Holy Mass during the eve of the feast and even though the statue was earlier moved to the Quirino Grandstand, there were huge throngs of the faithful attending the Mass and the vigil later on. 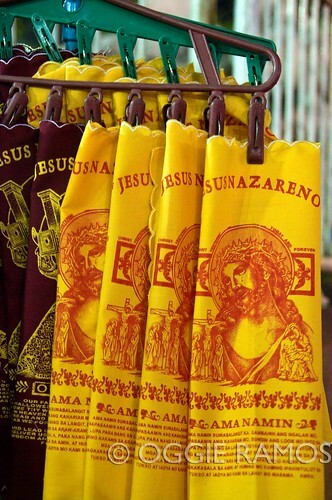 There was thriving commerce as well with mementoes of all sorts -- from colorful garments for Black Nazarene statues back at home to handkerchiefs with the image of the Nazarene, calendars to sampaguita leis -- being hawked at Plaza Miranda. Rampant commercialism or not, it is especially during these trying times when the naysayers and doom-and-gloom prophets forecast nothing positive, when we're reeling from the effects of last year's economic meltdown and series of calamities, that we cling on even more to the Divine for help and guidance. The feast is a celebration of faith, of thanksgiving for the year that was, optimism and hope for the year to come. PROCESSION ROUTE: Quirino Grandstand • left to Katigbak Drive along Padre Burgos St. • left to Taft Avenue through McArthur Bridge • right to Palanca St. • left to Estero Cegado • right to Carriedo • left to Evangelista St. • right to Raon • right to Quezon Blvd. passing through Quezon Bridge • left to Palanca St. • left to Globo De Oro St. • left to Gunao St. • right to Arlegui St. • right to Fraternal St., right to Vergara St. • left to Duque de Alba St. • left to Castillejos St. • left to Farnecio St. • right to Arlegui St. • left to Nepomuceno St. • left to Aguila St. • right to Carcer St. • right to Hidalgo St. passing through Plaza del Carmen • left to Bilibid Viejo passing through Puyat St. • left to Guzman St. • right to Hidalgo St. • left to Barbosa St. • right to Globo De Oro passing under Quezon Bridge • right to Palanca St. • right to Villalobos St. and leading to Plaza Miranda. One day I would like to witness this first hand. 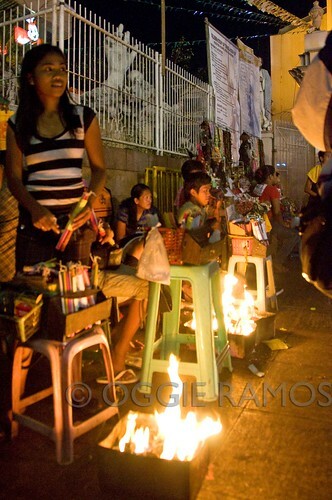 I cant remember really going there while I went to college in Mendiola. Same here. I wish we could cover the event in TOF in the future. 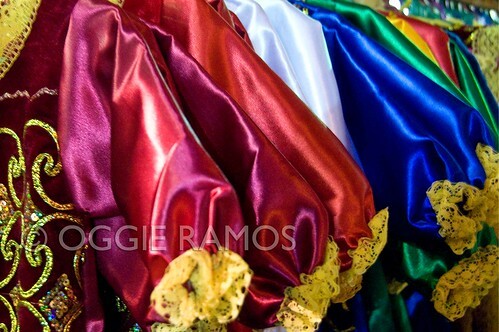 I think Filipino travel blogs will be not complete without posting an article about the Nazareno Procession in Quiapo. Photo Cache and TOF, I haven't attended the procession itself so far but maybe one day I will. :D Thanks for dropping by! AMAZING photos. Happy New Year! this is manny pacquiao's patron saint, right? what an experience it must be to be there.